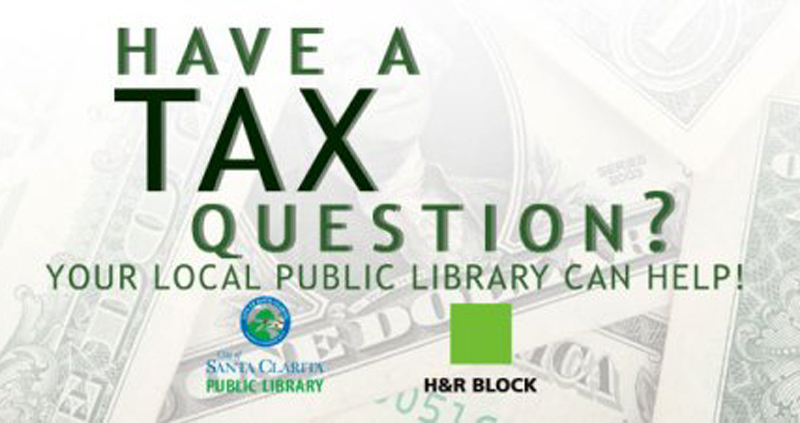 The City of Santa Clarita Public Library invites residents and businesses to a series of Tax Talks, happening Wednesday, March 13 through Thursday, March 28, at all three branches, including the Canyon Country, Newhall and Valencia Library. In partnership with H&R Block, the workshops will help residents learn about the new tax laws and the benefits they can provide to community members and businesses. The first class kicks off at the Valencia Library at 2:00 p.m. on Wednesday, March 13, 2013, for those interested in learning more about new California tax laws. The Old Town Newhall Library will host a small business tax class at 1:00 p.m. on Thursday, March 28. The Canyon Country Library will host a tax benefits class geared for students on Tuesday, March 14, 2013 at 1:00 p.m. as well as a tax issues class for retired taxpayers on Friday, March 22, 2013 at 1:00 p.m.
For more information on the upcoming Tax Talks, please contact Tax Associate and Office Manager from H&R Block Cindy Krett-Funicello at Canyon Country Shopping Center located at 19376 Soledad Canyon Road. For more information about these and other Santa Clarita Library events, visit SantaClaritaLibrary.com.